Juanita J. Hallett, age 92, of Delta, passed away Saturday, January 19, 2019, at Genesis of Swanton Valley, where she had resided the past six years. Prior to her retirement she had worked at the former Mohr's Five and Dime, which later became Mohr's Shoes, for 50 years. 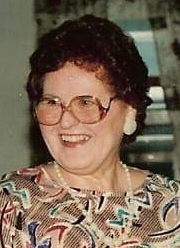 Juanita was born in Wauseon on December 5, 1926, the daughter of Douglas and Hazel Alice (Galbraith) Lozer. On June 30, 1969, she married Harold Hallett, and he preceded her in death in 1975. She is survived by her sister, Donelda (Elgin) Smith and nieces and nephews. She was preceded in death by her husband, both parents, and four brothers, Donald, Dale, Roger David, and Ronald. Visitation for Juanita will be held from 10:00 A.M. until 11:00 A.M. on Saturday, January 26, 2019, at the Grisier-Weigel Funeral Home in Delta, where funeral services will begin at 11:00 A.M. with Pastor Don Krieger officiating. A luncheon will immediately follow in the hospitality room at the funeral home. Interment at Amboy Township Cemetery will be held at a later date. Online condolences may be offered to the family at www.deltafh.com.